Hanoi (VNA) – Vietnam wishes to further deepen its comprehensive partnership with the US in a pragmatic and effective manner in order to contribute to the maintenance of peace, stability, cooperation and prosperity in the region and beyond. 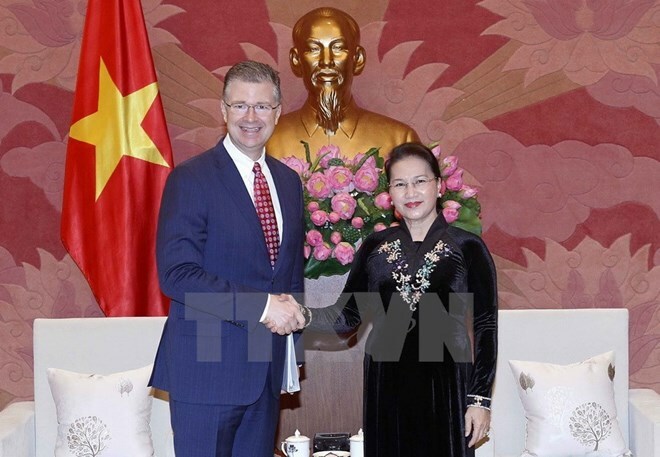 National Assembly Chairwoman Nguyen Thi Kim Ngan made the statement while receiving new US Ambassador to Vietnam Daniel Kritenbrink in Hanoi on January 9. She said Vietnam, in its foreign policy, always treasures relations with the US. The top legislator expressed her satisfaction at the bilateral growing cooperation in the fields of politics, economy, trade, science, technology, culture, education, defence and security. She said she believes that the administration of President Donald Trump will continue fostering bilateral ties. Hailing the new and practical progress in defence-security collaboration, NA Chairwoman Ngan said Vietnam will push ahead with cooperation with the US in non-proliferation of weapons of mass destruction, terrorism and cross-border crime combat, and handling of food, energy and water security issues. She expected the US Congress and Government to back the advancement of Vietnam-US trade ties and remove the catfish inspection programme of the US Department of Agriculture since its technical barriers could affect the lives of millions of tra fish breeders in Vietnam. She called on the US to continue supporting Vietnam in increasing capacity for Vietnamese marine police and strengthen cooperation in search and rescue, disaster relief, post-war bomb and mine clearance, environmental detoxification, and assistance to people with disabilities. Welcoming the positive attitude and standpoint of the US Congress and Government towards the settlement of disputes in the East Sea, Ngan said Vietnam hopes the international community, including the US, will continue consistent messages and policies to protect peace, stability, security and safety of navigation and aviation in the East Sea. Sharing views with the Vietnamese leader, the US ambassador said the US considers Vietnam one of the most important partners. The US Agency for International Development (USAID) in Vietnam has implemented cooperation programmes to support the Southeast Asian country’s development, he said. According to the diplomat, the bilateral trade relations are growing strongly with Vietnam being one of the fastest-growing export markets of the US. US President Donald Trump’s participation in the APEC Economic Leaders’ Meeting in Da Nang and his State visit to Vietnam in November 2017 reiterated the commitment to enhancing the countries’ comprehensive partnership, he noted.